Faced with the realisation that I was witnesssing the beginning of the end of a fight with cancer that had raged for eight years in someone very dear to me, I felt powerless to do anything to thwart the inevitable. It was in the final days of Pamela’s life that I realised the potential that myself, and my writer friends possessed, that would enable us to make a difference. They say that ‘Actions speak louder than words’… I beg to differ. The words that form the stories within this compilation will draw you through a range of emotions and scenarios – all different, all unique, but all centred around one theme. Relationships. The initial idea began when I posted a question for thought in our online Facebook based author group, the Indie Author Review Exchange (IARE), originally set up by one of the contributing guest authors, Paul Ruddock. I sent a single message out, asking the members if they would like to contribute a short story, with very little other information, save for the theme that I wanted it to be about. Within days, twenty-seven authors had committed to write, from various genres and with various publishing success. In the time it took for the first entry to be submitted, volunteers from within the group began to pour in with offers of help. A review team was soon assembled, an Editor-In-Chief – Lesley Hayes, voted in and from the main group, a technical wizard to oversee cover design came in the form of Nico Laeser, another contributing writer. Some of the writers in this publication you may have read before, if you’re a fan of Indie Author works that is – and if not, after reading this compilation, you may well become one. The authors have submitted short stories based upon a limited word count to reflect their interpretation of the chosen theme. Each work is an original piece, created specifically for this venture. Within the Anthology you will have the opportunity to contact any individual author for further information on their work, information on their websites and book links. There are currently 27 submitting authors, the details of whom I have added below for your information. Each and every one of these writers has a published work of their own, they are all extremely talented and spread far around the world. This is a testament to the power of the internet, to a shared mission to help those who need it by giving something back. My family life has been touched by cancer with two of my children’s grandparents suffering. We’ve seen both those who’ve won and lost the battle, and this is a chance to do something to help. My dad died of cancer, but his strength and determination amazed me. This is my way of honouring him, and the nurses who helped keep his spirits up. I wanted to contribute to this anthology because of the dear friends I have lost to cancer and because the Macmillan nurses gave them such help and support. Both of my Grandmothers died from cancer. My maternal Grandmother spent her last week in a hospice where she received brilliant care, the nurses were formidable. It’s an essential charity that I am more than happy to support in this humble way. In memory of my cousin, Melissa. One of the most hilarious, kind-hearted, and genuine women I have ever known. Fifteen years later, I still wish I had taken that crazy car ride around Murfreesboro with you. But thank you for making my awkward, teenage-self feel cool… even if it was in Arkansas. I lost both of my parents to cancer and also a few close friends, so I’m naturally committed to the MacMillan cause. I have seen the MacMillan nurses in action and couldn’t be happier to support their marvellous work. My mother was a volunteer cancer nurse, and also nursed my father who died from prostate cancer. This is my chance to honour their courage, love and strength. When I lost my mom, it would have been that much harder if there hadn’t been caring people supporting us at the time. Ian’s project reminded me of need to thank them. I have donated my piece in their honor, a small gesture to say thank you. Also the author of the spy thriller, Off-Wire (Lulu 2014), and the author/illustrator of the children book, Squared (beith David Publishing 2013). I lost both my father-in-law and mother-in-law to cancer before I really got to know either of them. I began and contributed to this anthology to support the work that the Macmillan Nurses do. My father, father-in-law and mother-in-law were all taken by cancer. This is a tribute to them all. I have dedicated this story to the memory of my father, mother and sister, all of whom died from cancer. I’ve been alongside several people affected by cancer. One familiar emotion is powerlessness. Contributing here seems a concrete way of continuing to be alongside, and to show that I care. Having lost my father through cancer, when asked, I had no hesitation in making a contribution through my writing, to this most worthy cause. I joined the anthology, at the time, because another story was needed. As I started to write, my story became a kind of goodbye to my dad and grandfather who died in 2001 and 2008 respectively. In memory of my father, I am grateful to contribute to this healing resource of hope and compassion. I made the decision to donate my time to this cause for my brother-in-law, Paul, who just recently fought and won the battle against testicular cancer. I am involved in this project as a thank you to those who cared for my husband. 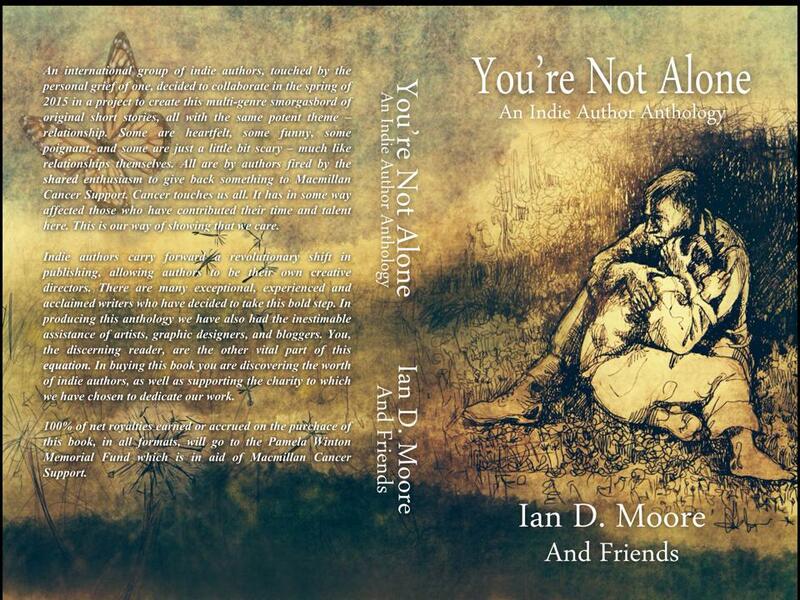 Helping with this anthology allows me to show my appreciation for those who cared for my dad. Knowing it was for a good cause, I decided to try something I’d never done before: write a short story. This experience has been uplifting and therapeutic, and I’m glad I took up the challenge. Never too old, has been inspired by my mother, who lost her husband and my father to cancer in 1993. I wanted to add a positive story about life afterwards. It was just an automatic response to a post that I saw. If my thoughts may support a good cause, it’s a great honor to get involved. After a close encounter with cancer I decided it was time I started pursuing my dreams. Being a part of this project is a tribute to a life-changing experience. I wrote this story for the anthology because, as a cancer survivor myself, I know first-hand just how important the kind of support MacMillan Cancer Nurses provide is. My hope is that “Dolphins Dance” reminds readers that life is better when we are connected to other people. My father died when I was two years old, from cancer. When I was diagnosed with the same insidious disease in 1999 I was terrified. I have enormous respect and gratitude for the medical team that saved my life and I hope this is a small way of saying thank you. I think you’ll agree, there’s some serious talent here. Multi-genre and a plethora of styles that has come together in one place to create something spectacular. In this collection you’ll find short stories to thrill you, they’ll scare you and leave you looking over your shoulder as you head back from your lunch break. There are stories of hope, stories of courage and stories of sheer determination, much like the very story that created this work to begin with. That’s how it all began, what can you do? Click on the top 3D picture and come and join us as we prepare to launch this to the world. Be ready to buy or reblog/share what you’ve found, help us to help those in need. Nicely done Ian. I’ll give it a nudge around the world with a little help from a handful of websites. Thanks Tom. In this as with the next planned edition, you have been a silent force. One of the many talented writers who stepped up to the plate on the basis of giving. I admire you for your conviction in that, my friend. It’s shocking to hear how many have been touched by cancer, but fantastic to see how everybody rallied to the cause to aid the Macmillan nurses. From all accounts, they do wonderful work. Lovely post, Ian. It was a great idea of yours to compile this anthology and lovely of Lesley and Nico and any others for their behind-the-scenes work. I’m looking forward to reading the book and buying a couple for friends too. We really appreciate the support and assistance of those helping us to get the word out there. I hope, when you have this anthology, that you find the stories commendable and enjoyable. They are very varied, unique and very entertaining. I am itching to see what people make in the reviews when they come.